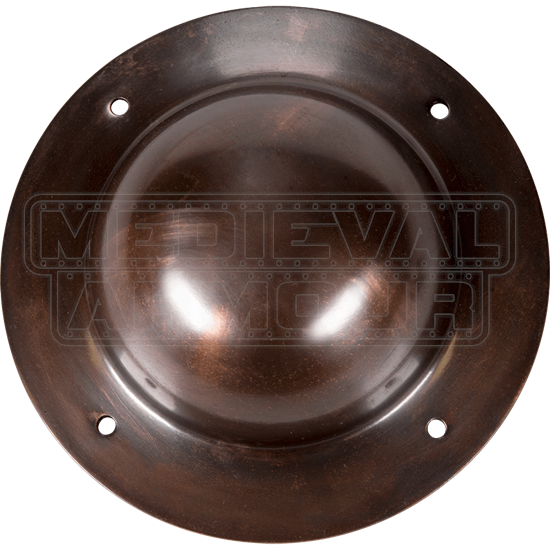 The Antique Copper Shield Boss adds extra defense and historical style to reenactment and prop shields. The round boss has a raised center surrounded by a wide edge with small round cut-outs for easier attaching to your shield. This rounded center was historically used to help large, round shields deflect enemy blows. Made of 14 gauge copper, this metal shield boss has been given an antique finish throughout, resulting in a weathered, historical look. Hardware is included for easier attachment to your favorite medieval or Viking shield.